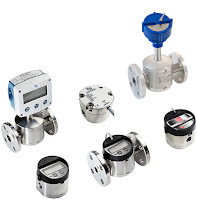 Although there are many types of flow meters used to measure fluid flow rates, positive displacement (PD) designs, including Oval Gear flow meters, are unique as they are the only meters on the market that directly measure actual volume. All other metering techniques infer the volume by making a type of measurement and equating it to the flow rate. One of the key criteria in selecting the right flow meter is the degree of accuracy dictated by the application. To meet high-precision requirements in various industrial environments, Oval Gear flow meters fit the bill. These meters feature a wide flow range, low pressure drop and extended viscosity range. Oval Gear flow meters offer easy installation and high accuracy, plus measure high temperature, viscous and caustic liquids with simple calibration. Oval gear flow meters are simple and robust. They operate by interlocking two oval gears, offset by 90 degrees, inside the meter housing which are then rotated by the flowing media. They are very rugged and designed to operate in very harsh environments. Accuracy is maintained irrespective of temperature, viscosity change, or flow pulsation. It's not unusual to see these meters perform in the field for upwards of 40 years. Download Oval Gear flow meter brochure here. For more information on Oval Gear flow meters visit https://teco-inc.com or call 800-528-8997.